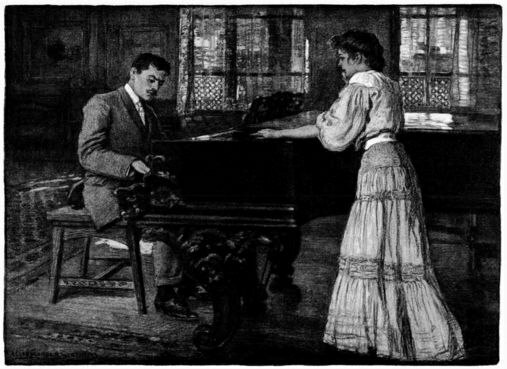 Vintage drawing of a gentleman playing piano for his lady. In a scene set in a drawing room, the grand piano sits on an Oriental style rug. The lady’s white dress adds a focal point to a picture with a lot of details to enjoy. This book illustration was drawn Alice Barber Stephens (1858-1932) and included in the 1908 work The Wayfarers.